Are these the angriest tracks on the web? I built a playlist of songs that most frequently appear in playlists with the words angry or mad with the Smart Playlist Builder. These are arguably some of the angriest tracks on the web. It is interesting to compare these angry tracks to the top tracks tagged with angry at Last.fm. I can’t decide whether the list derived from angry playlists is better or worse than the list driven by social tags. I’d love to hear your opinion. Take a look at these two lists and tell me which list is a better list of angry tracks and why. yep, this is totally unscientific poll, but I’m still interested in what you think. I spent this weekend at Rethink Music Hackers’ Weekend building a music hack called Map of Music Styles (aka MOMS). 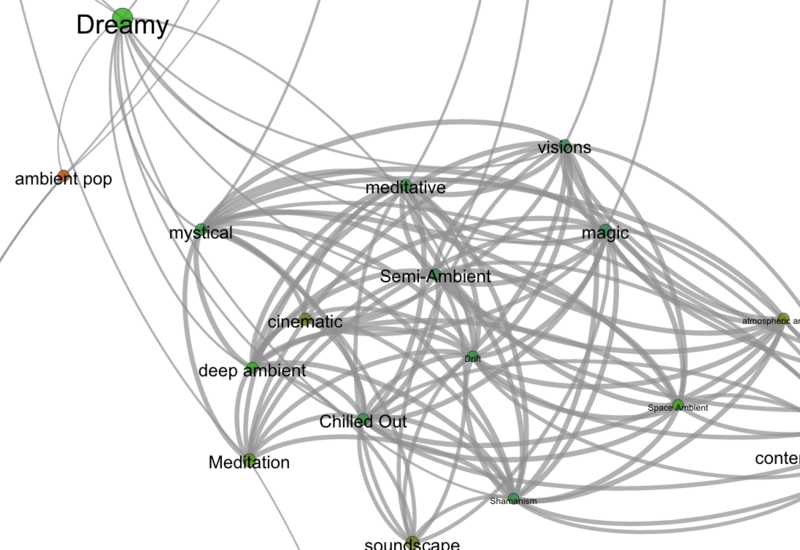 This hack presents a visualization of over 1000 music styles. You can pan and zoom through the music space just like you can with Google maps. When you see an interesting style of music you can click on it to hear some samples of music of that style. There are a few non-styles that snuck through – the occasional band name, or mood, but they don’t hurt anything so I let them hang out with the real styles. The app works best in Chrome. There’s a bug in the Firefox version that I need to work out. I’m fascinated with how music genres relate to each other, especially how one can use different genres as stepping stones as a guide through the vast complexities of music. There are thousands of genres, some like rock or pop represent thousands of artists, while some like Celtic Metal or Humppa may represent only a handful of artists. Building a map by hand that represents the relationships of all of these genres is a challenge. Is Thrash Metal more closely related to Speed Metal or to Power Metal? To sort this all out I’ve built a Labyrinth of Genre that lets you explore the many genres. The Labyrinth lets you wander though about a 1000 genres, listening to samples from representative artists. Click on a genre and the labyrinth will be expanded to show similar half a dozen similar genres and you’ll hear songs in the genre. I built the labyrinth by analyzing a large collection of last.fm tags. I used the cosine distance of tf-idf weighted tagged artists as a distance metric for tags. When you click on a node, I attach the six closest tags that haven’t already been attached to the graph. I then use the Echo Nest APIs to get all the media. 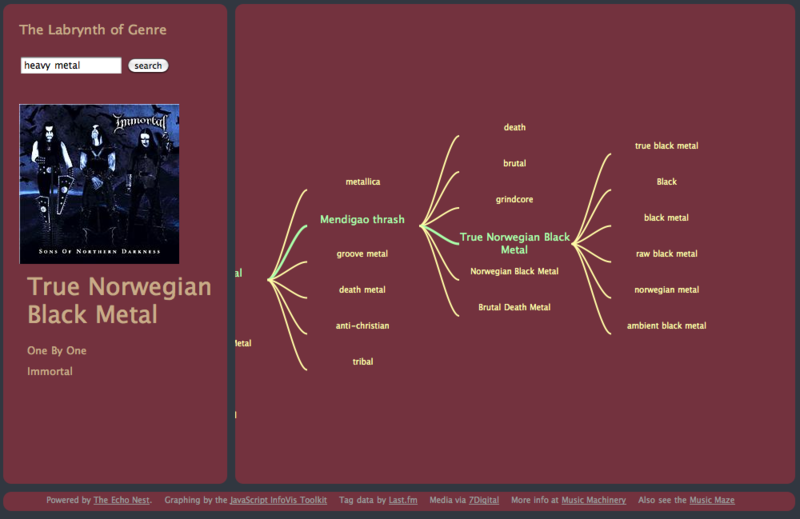 Even though it’s a pretty simple algorithm, it is quite effective in grouping similar genre. If you are interested in wandering around a maze of music, give the Labyrinth of Genre a try. Inspired by an email exchange with Samuel Richardson, creator of ‘Know your genre‘ I created a genre map that might serve as a basis for a visual music explorer (perhaps something to build at one of the upcoming music hack days). The map is big and beautiful (in a geeky way). Here’s an excerpt, click on it to see the whole thing. It is paper writing season with the ISMIR submission deadline just four days away. In the last few days a couple of researchers have asked me for a copy of the article I wrote for the Journal of New Music Research on social tags. My copyright agreement with the JNMR lets me post a pre-press version of the article – so here’s a version that is close to what appeared in the journal. Social tags are free text labels that are applied to items such as artists, albums and songs. Captured in these tags is a great deal of information that is highly relevant to Music Information Retrieval (MIR) researchers including information about genre, mood, instrumentation, and quality. Unfortunately there is also a great deal of irrelevant information and noise in the tags. Imperfect as they may be, social tags are a source of human-generated contextual knowledge about music that may become an essential part of the solution to many MIR problems. In this article, we describe the state of the art in commercial and research social tagging systems for music. We describe how tags are collected and used in current systems. We explore some of the issues that are encountered when using tags, and we suggest possible areas of exploration for future research. Paul Lamere. Social tagging and music information retrieval. Journal of New Music Research, 37(2):101–114. 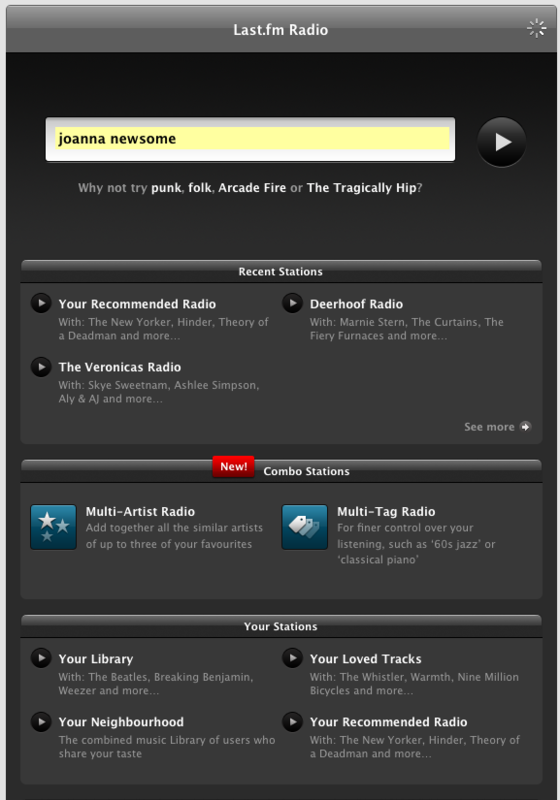 Last.fm pushed out a new web-based music player that has some nifty new features including an artist slideshow, multi-tag radio and multi-artist radio. It is pretty nice. I like the new artist slide show (it is very Snapp Radio like), but they seem to run out of unique artist images rather quickly – and what’s with the grid? It looks like I am looking at the artists through a screen window. I really like the multi-tag radio, but it is not 100% clear to me whether it is finding music that has been tagged with all the tags or whether it just alternates between the tags. Hopefully it is the former. Update: It is the former. 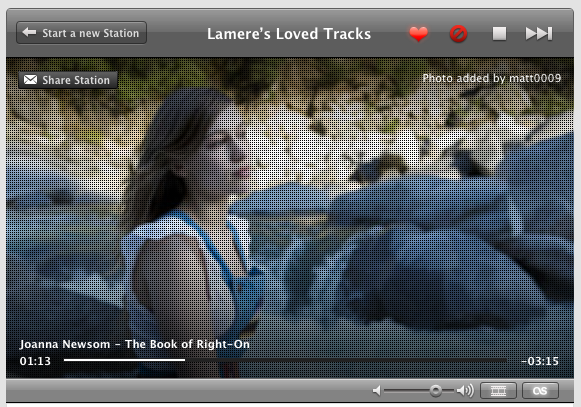 It is nice to see Multi-tag radio come out of the playground and into the main Last.fm player. It is a great way to get a much more fined-tuned listening experience. I do worry that Last.fm is de-emphasizing tags though. They only show a couple of tags in the player and it is hard to tell whether these are artist, album or track tags. Last.fm’s biggest treasure trove is their tag data, so they should be very careful to avoid any interface tweaks that may reduce the number of tags they collect.